Queensland’s fabulous Gold Coast is, arguably, Australia’s premier holiday region. With a wonderful year-round climate, beautiful beaches, and brilliant nightlife, this is the holiday destination of choice for a vast number of Aussies, us included. We arrived at the Radisson Palm Meadows Resort ([star][star][star][star]) on a Saturday in late May. Only a few days away from the start of winter and the days were still sunny and warm with temperatures in the mid-20’s, Celsius, every day. It couldn’t have been more perfect. There is a multitude of things to see and do on the Gold Coast with more than 50 attractions right in the heart of Surfers Paradise and we were certainly spoiled for choice but with only a few days here we knew there was absolutely no possibility of seeing it all. In fact, we probably wouldn’t even see a tenth of it. Not that we wouldn’t try. But we decided that a visit to the beach was an absolute must, as was one of the theme parks. A canal cruise and some shopping in Surfers Paradise were also on the list and we were determined to sample some of the nightlife. The beginning of the strip known as the Gold Coast starts at Coolangatta, right on the New South Wales/Queensland border and stretches all the way to Southport in the north. The long, unending stretch of sandy beaches that give the region its name, and the surprisingly warm water, enticed us the next morning to take an early walk along the sand at Coolangatta Beach. With cooler weather not too far off, there were many swimmers and surfers making the most of the sparkling morning. road, it was obvious that they definitely had no road sense! They just wandered around like Brown’s cows! 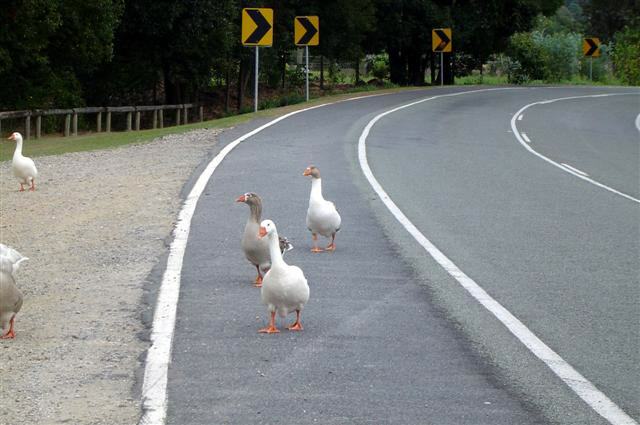 And right there on the road they were sitting ducks for any drivers who might have been travelling a bit fast. John said if they didn’t move they’d be dead ducks! (puns intended). 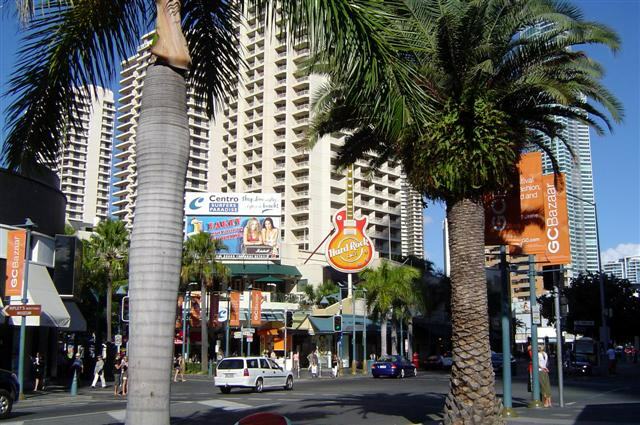 Shopping on the Gold Coast is an experience not to be missed. 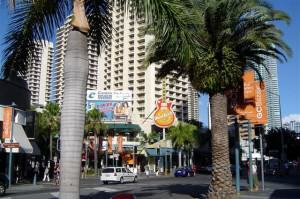 There are several different centres and we chose Cavill Avenue, in Surfers Paradise. The Circle On Cavill is a brand new shopping and leisure precinct boasting an open-air piazza and video-screen entertainment. With all those stores, John made sure his credit cards were firmly out of my reach! There was ‘live’ entertainment, in the form of buskers, performing for the crowds around the piazza and a concert screening on the video-screen. We mingled with the crowd watching the concert for a short while before going for a walk around this vibrant part of the city. Not far from there we stopped at a fun park where a very brave young lady did a bungy jump, and forgot that she was wearing a skirt, and some adventurous young fellows rode something called the Sling Shot, which I think just about put them into orbit! 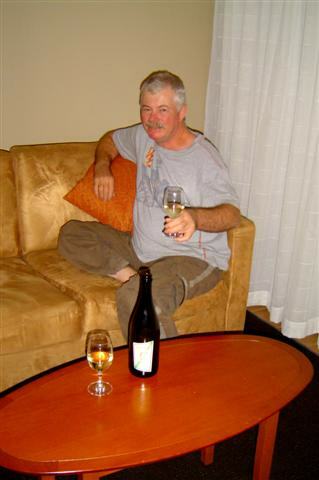 Traipsing around Surfers Paradise and the shopping precinct all day had left us exhausted and so, laden down with a “few” souvenirs for the grandkids, we headed back to the resort and settled down with our bottle of Two Tails Sparkling Wine to celebrate our arrival. One glass was enough to have me nodding off and it wasn’t long before I was tucked up in bed. The nightlife would have to wait for another time! Three of Australia’s best-known theme parks can be found on the Gold Coast and deciding which one to visit was not at all difficult. In previous holidays here we’d each been to Seaworld and Dreamworld and so that left Movie World. The Batwing Spaceshot was the first ride we saw when we walked through the gate – were we going on it? Not a chance! We left that for the somewhat more adventurous types but we stood and watched those brave enough to ride on a rapid 4.5g vertical launch to the top of a 60-metre (200-foot) tower followed by a drop into a terrifying negative g descent! More than one of the people on the ride walked away from it on knees turned to jelly! As I said, I’m not that adventurous! Rollercoasters. Only for the young and adventurous! 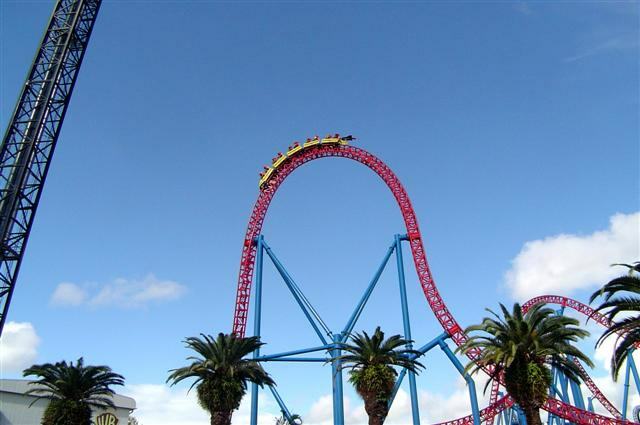 The Superman Escape rollercoaster is another ride that is out of this world! 0 – 100kph (60 mph) in 2, yes 2, seconds! 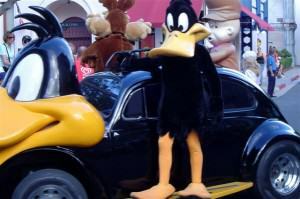 For those who like their rides a little less exciting there are several in the Looney Tunes Village, including the Looney Tunes River Ride. Now that was more my style! Although when we reached the end there was the possibility of a ride over a waterfall that didn’t thrill me. Luckily that didn’t happen. The shows beckoned and we went to the Police Academy Stunt Show that had us rolling around in laughter. It was a comedy of errors about a jailbreak and had everything from cars and motorcycles, not to mention a hapless sidecar passenger, to an exploding helicopter! It was a half hour of side-splitting fun and easily the most popular show there! Another of the popular shows is the Shrek 3-D Spectacular where, with the aid of special glasses, we had the characters on the screen virtually sitting in our laps! Outside the Shrek Show we ran into Scooby Doo and he was happy to pose for the cameras. After lunch it was off to Wild West Falls for some cowboy fun! There’s a saloon (not a real one! ), the Sheriff’s office, the Wild West Log Ride, and the Undertakers Shop. It was all quite authentic and it certainly wasn’t hard to picture a couple of gunfighters advancing on each other in the main street, or a fight in the saloon, or the bad guy in the black hat being shot and falling off the roof. Or the wagons circling before the Indian attack! Or John Wayne riding into town. You’re right, I’ve seen too many western movies! The Log Ride looked interesting and I thought I might like to give it a go, until I saw what happened at the end! The “log” would wind its way through the mountain and end with a rapid ride down the waterfall! The occupants of said log becoming drenched in the process. Now if the weather had been really hot I might have been tempted but . . . John decided to try out the wares at Custom Caskets and judging by the amount of dirt in the bottom of it I’d say he wasn’t the first one that day and probably wouldn’t be the last! It was time for the parade and we joined the crowd along Main Street and waited for our favourite characters to come into view. 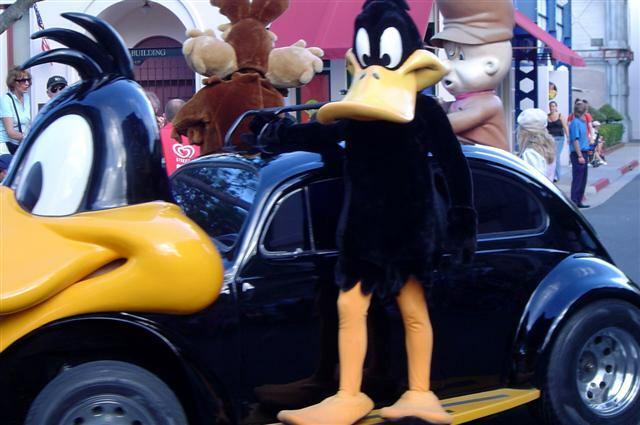 From Austin Powers to Cat Woman and Daffy Duck, they were all there. For us it was the perfect end to a perfect day. 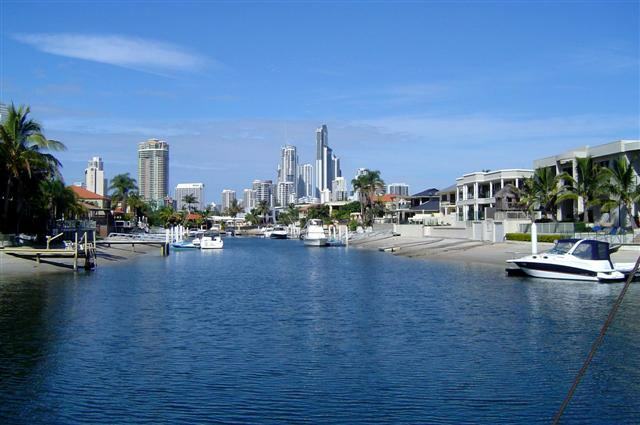 The Gold Coast is home to 270 kilometres of navigable waterways, the Broadwater Canal, and there is no more pleasant way to see this part of the region than from a boat. And so, the next day we cruised aboard the MV Jindalee of Broadwater Canal Cruises along the canals and seaways. The Seaway provides safe ocean access for vessels of all types and a deep-water port for container ships. In our 2-hour cruise we saw some of the most expensive real estate we’ve ever seen. Some absolutely beautiful homes, many with their own boat ramps or docks, and boats moored and even the odd one or two with their own heli-pads and helicopters. Our skipper gave us a running commentary on many of the places we saw as well as a bit of information about the canals themselves and the view of the Surfers Paradise skyline from the water was amazing. 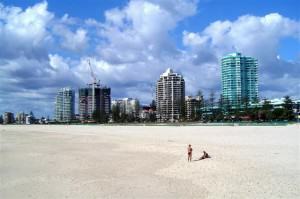 The tallest building on the Gold Coast is the Q1. At 80 storeys it is also the tallest residential building in the world. We cruised past the “Love Shack”, a boat that needs no explanation, and the Floating Chapel, which is the venue of choice for many weddings and christenings. Complete with resident Minister, this chapel cruises the waterways on a daily basis. Broadwater Canal Cruises operates 3 2-hour cruises every day, morning, afternoon, and sunset, and provides morning and afternoon tea and a complimentary glass of champagne on the sunset cruise. After our cruise we drove out along The Spit to a park overlooking the Southport Bar where we watched some fellows on surf skis and the boats coming and going while we had lunch. There were also people in the water swimming across the mouth. I thought that they were either very brave or very foolish, depending on whether or not they made it safely. No visit to the Gold Coast is complete without sampling some of the nightlife and we took ourselves off to Conrad Jupiters Casino for dinner, entertainment, and, of course, a visit to the casino. Never having been that interested in gambling before, we were fascinated. We stayed for a while in the casino, watching others more than doing any gambling ourselves although that’s not to say we didn’t have a flutter but I was amazed at the amount of money being lost at the tables. The show left us breathless! The show currently playing was Zingara, the fantasy story of a gypsy queen and for a while we were transported to the Europe of old in “a journey filled with music, dance, illusion, acrobatics, and death-defying stunts” that left us breathless. Jupiters is on the Gold Coast Highway at Broadbeach and, believe me, you can’t miss it. It’s bounded on 3 sides by the canals so it’s almost an island unto itself. There are several restaurants and we decided on Zen, reputed to have the best Chinese anywhere on the Gold Coast. We certainly weren’t disappointed; I can’t remember when I’ve enjoyed Asian food so much. 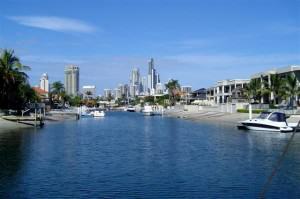 The Gold Coast isn’t only about beautiful beaches and waterways. 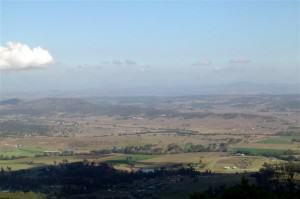 About an hours drive west of Surfers Paradise is the stunning Hinterland. An area of approximately 7,000 square kilometres (2700 square miles) includes mountain ranges, 7 national parks, and World Heritage rainforests. The Lamington National Park encloses Australia’s largest preserved stand of subtropical rainforest. 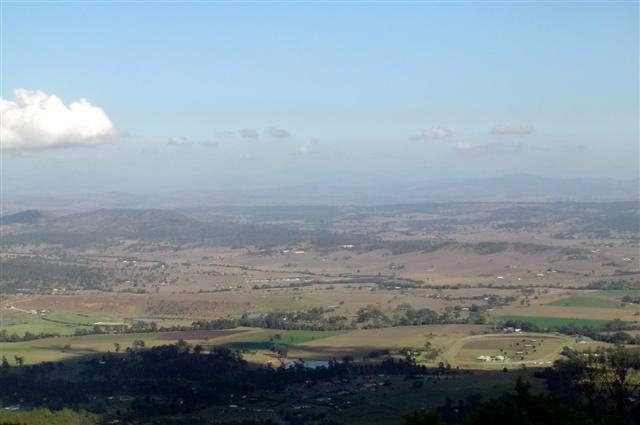 Tamborine Mountain is a great place to stop for a picnic and to visit the many craft workshops, wineries, and galleries. And there are some spectacular views towards the Pacific Ocean and Mt Warning. We stopped for a coffee break in the park and as soon as we got out of the car we were reminded that winter is just around the corner and we hastily donned our sweaters. In spite of the chill, it was lovely and I can imagine how beautiful it must be in the winter even though I doubt that they see snow in this area. Also in this region, Australia’s largest glow worm colony makes its home in the Natural Arch Cave where a spectacular waterfall cascades through the roof and into an icy pool. There are guided tours through the rainforests of the Springbrook Plateau into the Natural Arch to see the glow worms in their natural habitat. At Cedar Creek Winery we ventured into the artificial Glow Worm Cave. Glow worms of course, are best viewed at night but the conditions in these caves allow for viewing at any time. The idea for an artificial cave arose from concern over increased tourism in the Tamborine National Park at night and it has proved to be extremely popular with tourists. 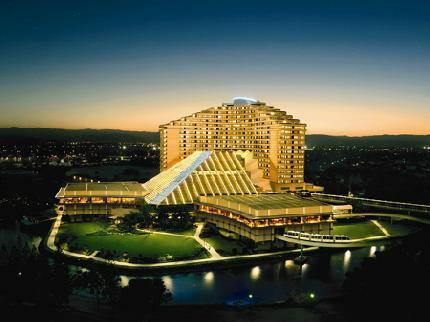 The Gold Coast stretches from the New South Wales border in the south to Southport in the north, a distance of some 25 kilometres (15 miles). To coin a phrase, we barely scratched the surface of things to see and do here but we tried to fit in a good cross-section of the Coast. We had a fantastic few days and with the wonderful diversity of attractions and places to visit, and the perfect year-round climate, how could you not have a great holiday?